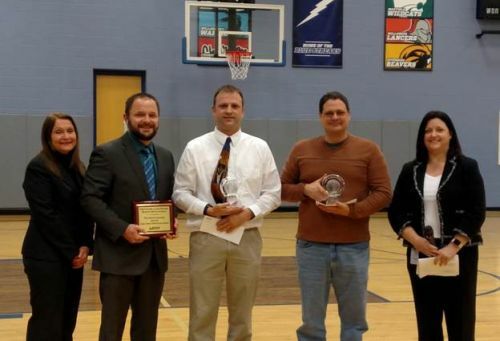 CLEVELAND, Ohio, Feb 7, 2019 - (ACN Newswire) - The Lubrizol Corporation, in partnership with the Lake County Educational Service Center (ESC), announces the teacher team of Greg Clark and Lee Polzer as the winner of the annual Lubrizol Lake County STEM Teacher Award. The seventh-grade teacher team at Madison Middle School was selected for its innovative, interdisciplinary project-based lessons that engage students with connections to the real-world. As recipient of the award, the team will receive $5,000 for STEM-related teaching expenses and team leader Greg Clark will receive sponsorship to attend the Ohio Chemistry Technology Council (OCTC) Teachers, Industry and Environment (TIE) Conference. In addition, Madison Middle School will receive an award of $5,000 for STEM equipment. The award selection panel consisted of representatives from the Lake County ESC and Lubrizol employees. Addressing the Madison Local Schools teacher and administration, Julie Edgar, corporate vice president of innovation and chief sustainability officer for Lubrizol, honored the team by highlighting how the team approach combines innovative teaching techniques, real-world examples and academic topics all designed to strengthen student engagement and improve student outcomes. Edgar states, "This unique program prepares students to gain more marketable skills for the real working world, such as being good communicators, problem solvers, self-motivators and team players. Given the clear student success, it is obvious to me that teaching in new ways can have a positive effect and further the mission of STEM." The 2018 - 2019 school year also marks a significant milestone for Lubrizol's signature STEM education outreach program. This year's teacher team is the 25th annual Lubrizol Lake County Science / STEM Teacher Award winner. In the award's 25-year history, Lubrizol has honored more than 70 Lake County teachers.